From the unique Trevor James Alphasax to the Signature Custom Pro horn there really is a TJ sax designed and ready for you! A popular and innovative saxophone developed for the very young player who had previously been told that they had to wait until they grew bigger until they could play the sax! Multi award winning saxophones designed 30 years ago and further updated in 2012. 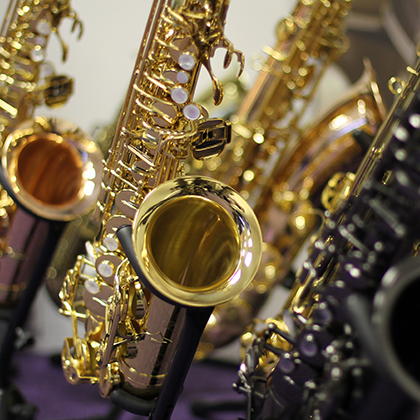 One of the leading student saxophone models on the market. A one finish (frosted gold) horn with a huge 'voice' due to the innovative crook design on a sax at this price. An ideal 'upgrade' sax for the player wanting just that little bit extra from their instrument. More advanced instrument features and tonal characteristics to suit those buying their next horn. With an expanding worldwide network of top professional sax players now choosing the SC sax (especially the 'RAW" XS model) as their horn of choice, the Signature Custom saxophones are professional alto and tenor saxophones for the serious player. www.rawsax.com for pro-horn website. A strictly limited edition of 100 professional tenor saxophones. Each horn is individually unique (numbered) and named after a favourite world city where UK 'Sax Legend' Andy Sheppard has performed. Hand built in our Lenham pro sax workshops, every AS saxophone is built to order and then tested by Andy himself!